We wanted to do something special for my daughter's kindergarten teacher. She had been such a great teacher and positive influence on my middle child. We wanted to make her something homemade, and I noticed in her classroom she has some gifts from former students displayed on the walls (pictures with cool teacher sayings, notes from parents, etc). 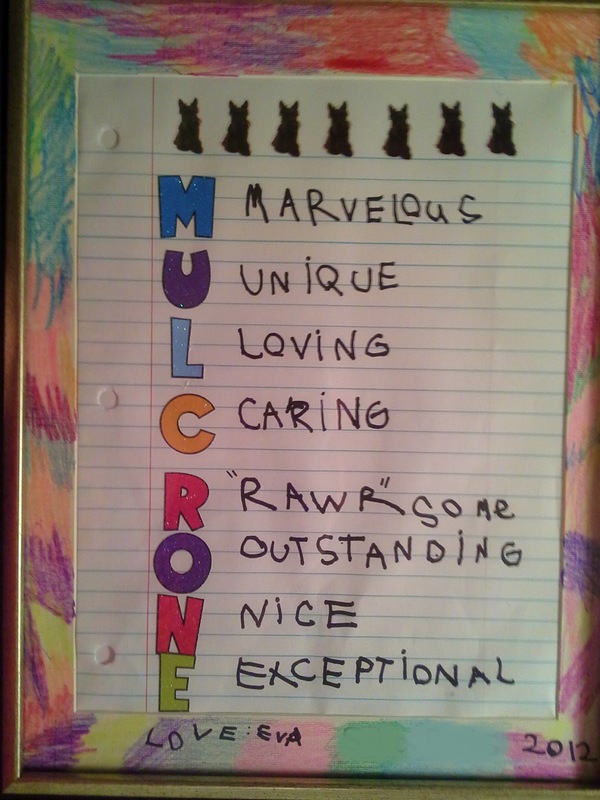 So we decided to make an acrostic. What's an acrostic you say? Well at the time I didn't know what it's official name was. When the teacher actually pulled it out of the bag I thought she had said, "Oh a cross stitch"... which turns out was not the case. The true definition is: An acrostic poem uses the letters in a word to begin each line of the poem. All lines of the poem relate to or describe the main topic word. We just took the first letters of her last name and stacked the vertically, then horizontally we added one characteristic/adjective about her for each letter. The supplies were not expensive. We bought a nice document frame from Walmart for $5, a piece of wide-spaced notebook paper, a package of sparkly letter stickers for $3, and a package of doggie stickers $2. Then we customized it for this particular teacher. This teacher loves scottie dogs, so we picked out those stickers. My daughter did most of this work herself. (It was hard for me as a perfectionist to let her do most of the placing, as I wanted it so bad to be lined up and with properly with good visual white space around it. However it was also important that she do most of the lettering because it with this teacher who taught her all the letters). I wrote out the big words on a piece of paper and placed it underneath so my daughter could trace the letters. We left the putting on of the capital letter stickers for last, in case there were any mistakes. At the end we decided the creamy white border was a bit bland and we decided to gussy it up with some color. My daughter had fun picking all kinds of colors and coloring away. At the end she signed her name and the year then we wrapped it up ready to give on the last day of school. This is Eva and her teacher Mrs. Mulcrone after she gave her the present. She was so proud of her picture and the teacher loved it. Even though there were only 10 minute left in class on the last day, she told the kids what an acrostic is, then used it to teach the letters in her name, even had the class count the scottie dogs across the top (you have to love teachers, they love to teach). After that she read them a book called "The last day of Kindergarten". I love her so much, she is such a warm caring teacher. By the way if you were wondering, the "Rawr-some" for the R letter is because their class has the theme of grizzly bears and they do this little cheer where all the kids "rawr" at the end of it, so we made awesome into "rawr-some". So there you have it, a nice little unique and personalized end of the year teacher gift from your little ones. You could also use this idea for a parent, or grandparent, father's day or mother's day, get as creative as you want! Have fun.